4. Ticket sales are limited to a maximum of 2 tickets per person for the pre-sale. Foals have announced dates as part of Forest Live, the summer concert series organised by the Forestry Commission. 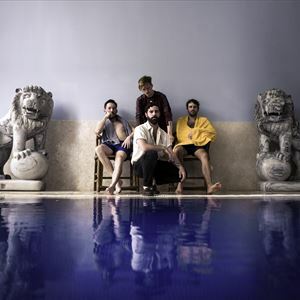 From playing chaotic house parties in their home city of Oxford to becoming major festival headliners across Europe, Foals' trajectory has been remarkable. They've earned critical acclaim (NME and Q Award wins, plus Mercury Prize, Ivor Novello and BRIT Award nominations) and fan devotion (1.7 million sales of their four Gold-certified albums, plus over half a billion streams at Spotify since 2015) in equal measure. And while the majority of contemporaries have fallen by the wayside, Foals continue to hit new peaks. After more than a decade in the game, Foals again embrace that love for the unconventional with the bravest and most ambitious project of their career: not one, but two astonishing new albums: ?Everything Not Saved Will Be Lost'. A pair of releases, separate but related, they share a title, themes and artwork. ?Part 1' will be released on March 8th, with ?Part 2' following in the autumn. ?They're two halves of the same locket,? frontman Yannis Philippakis explains. ?They can be listened to and appreciated individually, but fundamentally, they are companion pieces.? Profoundly tethered but possessing their own personalities, the two bodies capture the most compelling, ambitious and cohesive creations that Foals - completed by Jimmy Smith (guitar), Jack Bevan (drums) and Edwin Congreave (keys) - have ever produced. The albums' lead single ?Exits' is a case in point, featuring Philippakis conjuring the image of a disorienting world via a contagious vocal melody. It's a fresh anthem for Foals' formidable arsenal, but also an ominous forecast. ?There's a definite idea about the world being no longer habitable in the way that it was,? says Yannis. ?A kind of perilousness lack of predictability and a feeling of being overwhelmed by the magnitudes of the problems we face. What's the response? And what's the purpose of any response that one individual can have? ?